Tesco admitted that in 2013 that it was in talks about opening a store on the London Road, but would not say whose premises it plans to take over, and rumours were rife. Brambles at 93 London Road closed on 30 November 2013 after 18 years in Headington. The freehold of this A1 retail unit with accommodation above was for sale with Scott Fraser, and the Oxford Furniture Warehouse is now renting the shop from the new owner. The Oxford Furniture Warehouse opened at 83 London Road on 9 April 2013 in the former Today’s Local shop, which closed in October 2010. Just five months later on 7 September 2013, however, they received a letter from their landlord’s solicitors giving them three months’ notice to quit as from 11 December. They reopened in the former Brambles shop at 93 London Road on 9 December 2013. This shop was also given notice to quit along with its next-door neighbour above, and moved across the road to 106 London Road (the former Cartridge World shop) on 15 October 2013. This nail bar opened in the former Oxford Design shop on 14 July 2013. W. H. Smith started testing a franchise model in 2013 at the former Crown News at 99 London Road, Headington, whereby an independent newsagent runs a store under the W. H. Smith Local brand: more information. In 2012 planning permission 12/00681/FUL was granted for "Erection of single-storey rear extension to provide additional retail space, store and staff facilities" at this shop. Londis on the London Road was granted an extension to its licence in 2013 to enable it to sell alcohol for consumption off the premises 24 hours a day, seven days a week. D. L. Hancock Ltd opened in February 2013 in the former Laura Loves Flowers shop at 126 London Road. They are the only independent family-run funeral directors in Oxford, as S. & R. Childs were taken over by Dignity in early 2013. Peacock’s at 98 London Road closed at Christmas 2013. This café at 3 Manor Buildings, Osler Road closed on 3 July 2013. This shop at 113 London Road (formerly Caffe Toscano), is classified as A1 retail and closed in January 2013. This shop at 138/140 London Road closed in 2012. This pawn shop at 112 London Road closed down near the beginning of August 2013. This shop, which closed in January 2013, is classified as A1 retail. It was formerly the Chef’s Pantry; then La Plaza (which closed in 2004 when it failed to get a certificate of lawfulness (04/00942/CEU) authorizing its A3 café use); the Copacabana Café; and then the Caffe Toscano (which, despite its name, was deemed to be retail by the city council). The leaseholder was planning to sell the business to Martin’s estate agents, but they withdrew when the city council planning department told them that they would have to apply for planning permission for change of use, and that previous applications for A2 (office) and A3 (café) had been refused because of the Local Plan: 11/02344/PDC. Oxfordshire County Council agreed in early 2013 that Windmill Primary School should have a three-class entry, making it the largest primary school in the county. The shop is classified A1 retail). It was formerly the Chef’s Pantry; then La Plaza (which closed in 2004 when it failed to get a certificate of lawfulness (04/00942/CEU) authorizing its A3 café use); the Copacabana Café; and latterly the Caffe Toscano (which, despite its name, was deemed to be retail by the city council). The leaseholder was planning to sell the business to Martin’s estate agents, but they withdrew when the city council planning department told them that they would have to apply for planning permission for change of use, and that previous applications for A2 (office) and A3 (café) had been refused because of the Local Plan: 11/02344/PDC. Application 13/02076/FUL for the erection of a two-bedroom dwelling at 7 Stephen Road was approved in September 2013. An earlier planning application 12/01926/FUL for a house on this site was refused on the grounds that (1) it would be a discordant and contrived feature in the street scene and (2) there has been no field evaluation in respect of the Anglo-Saxon cemetery near the site. Oxfordshire County Council’s 18-month experimental closure of the crossover gap in the central reservation of the A40 London Road dual carriageway at its junction with Collinwood Road started on 21 May 2012 ended in November 2013, and although Risinghurst residents back its reopening, it is to remain closed permanently. Susan Brown (Labour), who served as city councillor for Churchill ward until 2006, was re-elected on 2 May 2013 in place of Joe McManners, who had resigned. The East Oxford Community Classics Centre was officially opened by Professor Mary Beard at Cheney School, Headington on 24 October. Abacus College (a small independent school, which also includes the Oxford Language Centre) took over the two floors of offices at Victory House (situated above Londis at 116–120 London Road, with entrance in Windmill Road) for educational (D1) use in early 2013. These offices had been vacant since November 2010. Abacus College was based at Threeways House in George Street from 1992 to 2012. It was founded 40 years ago as St Aldate’s College and is part of the David Game College group. It has between 120 and 150 students, two-thirds of whom attend at any one time. Demolition of 53 Kennett Road started in week beginning 19 September 2011, and Oxford’s first passive house was completed in early 2013. The pigeons roosting on top of the charity shop next to Greggs are causing a problem: at least one of them regularly enters through its open doors, and each time this happens the shop has to close and throw away food. The Oxford Furniture warehouse moved from Abingdon Road to the former Today’s Local drink store at 85 London Road on Monday 8 April 2013. In May 2013 the County Council completed a £70,000 scheme to make the section of Jack Straw’s Lane between Doris Field Close and Staunton Road the first bicycle street in Oxford, with a line down the middle separating two wide cycle lanes. Drivers are expected to wait behind cyclists instead of overtaking them. The building of two new University of Oxford medical research buildings on the Old Road campus was completed in 2013. Planning application 11/01054/FUL was approved on 3 August 2011 by the city council’s East Area Planning Committee for this new £57m development on its Old Road campus, and although the decision was called in to be reviewed, it was again approved on 31 August 2011. Quarry & Risinghurst city councillor Dee Sinclair became Lord Mayor of Oxford in May 2013. Headington residents were in 2013 the first in the city to get speed-checking devices. The Oxford Campaign for Real Ale (CAMRA) awarded their pub-of-the-year award 2013 to the White Hart in Old Headington. Oxonbike, Headington’s bike hire pilot scheme, was launched for the first time on 20 June 2013, but Grand Scheme Bike Share, the firm operating it, went into receivership in November 2013, disrupting the service in the short term. The county council consultation on transport problems in Headington and the surrounding areas closed on 11 October 2013. TonyOX3 posted here the responses of the Friends of Old Headington, Oxford Civic Society, the two Headington Ward LibDem councillors, and Headington Action. Oxford City Council replaced some of the larger bins in Headington car park near Waitrose with smaller ones in 2013 to make more room. There were then 14 recycling bins there, some of them provided by charities. "County Council chooses Osler Road for new bus routes"
The Café Noir at 3 Manor Buildings, Osler Road closed on 3 July 2013 after 24 years in Headington, and was snapped up by Jacobs & Field. Rosemary’s Restaurant at 81 London Road was renamed the Rose Tree in October 2013, and planning application 13/02820/ADV for a new internally illuminated fascia sign was approved in December. The Crown & Thistle pub in Old Road closed in December 2011. Three men from Marston bought the pub from Greene King for £425,000 at the beginning of 2013, and planning application 13/01588/FUL that they submitted in June 2013 to build three four-bedroomed houses on its car park was approved. Fleurets sold the pub, and an article on this page of the Sidney Phillips property magazine confirms that there were seventeen offers for it, and that Shinder Pal Singh, one of the three new owners, intended “to consider alternative uses for the property”. There is a possibility that the pub itself may remain. Enterprise Inns have sold the Fairview Inn in Glebelands, and it is likely to stay open as a pub, even though Fleurets had put it up for sale with “alternative use potential”. Local residents ran a campaign to keep it as a pub, and a nomination to make it an “Asset of Community Value” was agreed by the city council; but they failed to raise enough money to buy it. This pub, which was for sale for a very long time (with its price latterly reduced from £899,000 to £775.000) was sold to Seville Developments of Rugby for £600,000 in mid-2013. Everards purchased the freehold of the Black Boy pub in Old Headington from Greene King in 2013, but the restaurant continued as before under the same management. New students moved into the rooms on this site in September 2013. Planning application 11/01681/FUL by property developers I & O Ltd for “58 ensuite student rooms with shared facilities and warden’s room on three floors” was approved in 2011. (This did not include the shop that was part of the earlier approved application (10/03215/FUL). 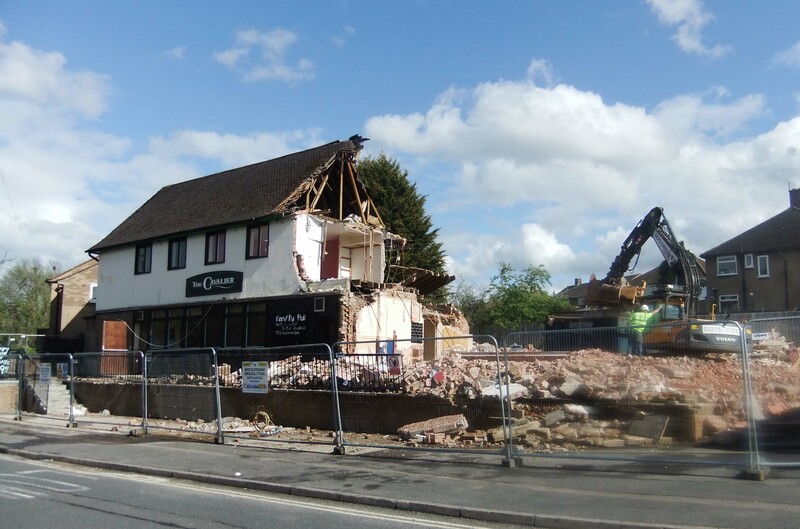 Demolition of the Cavalier pub at 148 Copse Lane, which was built in 1956 to serve the Northway estate, started in week ending 27 April 2012 (picture). A planning application by Ivor Rhys Ltd on behalf of Haseley Homes Ltd for the rear of 82, 84 and 86 Windmill Road, next to Norton Close, was approved in June 2013: “Erection of 2x3 bed dwellings and 1x2 bed dwelling (Class C3) in terraced block with associated bin and cycle stores”. The appeal against the refusal of their former plans for a two-storey block of five flats and three terraced homes was dismissed on 21 January 2013. The Oxford Guest House opened at 228 London Road near the end of 2013. The Headington Festival 2013 took place on Sunday 2 June. Work on the extension to Headington Preparatory School was completed in September 2013. In 2013 William Hill lost its appeal to the Secretary of State against the City Council’s refusal of planning permission for the former Cartridge World shop at 106 London Road for “Change of use from retail unit (Use Class A1) to licensed betting office (Use Class A2). Alterations to side elevation and shopfront”. 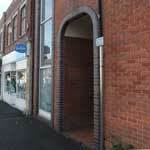 The shop closed since June 2011 and was advertised to let with Liggins Thomas for £30,000 per year. Work to increase the floor size from 77sq.m to 126sq.m. by extending over the yard at the back, (following the approval of the earlier application 11/02506/FUL submitted by the landlord) came to a halt early in 2012. Up & Running moved into the shop in November 2013. Police called for witnesses to an armed raid at Lloyds TSB Bank in Headington at 9.53am on Monday 21 January 2013. Other Headington people who entered included James Burns (Lettings Manager for Andrews in Headington) and Mandy Hasluck (a teacher at Headington Preparatory School). The social housing on the Manor Ground site was completed in early 2013. The hospital planning application for the Manor Ground site that was approved back in 2001 included social housing, but originally the developer only built the “unsocial” flats. Approved planning application 10/00952/FUL was finally submitted in April 2010 by the Greensquare Group Ltd for the social housing element (27 flats with 20 car parking spaces in two three-storey buildings). Feltham Construction started work on building 27 flats on the Manor Ground site in week beginning 16 January 2012. At the Headington Ward Focus meeting on 19 June 2012, the suggestion of Blackburn Close for the new development was agreed. Mrs Blackburn (the mother of Mrs Barbara Woodhouse) lived nearby at Sandfield (now the site of Horwood Close). Oxford Association for Young People (OAYP) moved from Garsington to the upper floor of Bury Knowle Coach House in April 2013: picture. This charity offers support, education, and activities to youth groups in Oxfordshire, and it also hosts the Oxfordshire Youth Awards. Approved planning applications for the church site in 2013 were 12/01594/FUL (Laying out of tarmac drive with resin bonded surface between churchyard and Quarry Road) and 12/02031/CAT (Felling a larch tree in the churchyard). This city council depot site on this corner was sold for £150,000, and planning application 12/01112/FUL for the erection of a two-storey building comprising three flats (2x1 bed 1x2 bed) with ancillary amenity space at was approved at the East Area Planning Committee meeting on 14 August 2012. Outline planning permission for the demolition of the existing building next door to 70 New High Street and the erection of two two-bedroomed flats was approved in 2011 (11/00774/CT3), after an original plan for three flats was withdrawn. All Seasons Guest House in Windmill Road was refused planning permission in 2013 for “Change of use of outbuilding (use class B8) to form guest accommodation and alterations to existing guest house (use class C1) to create 8 bedroom guest house (use class C1) with ancillary works including parking and cycle provision”. The county council introduced short-stay charges of £2.00 at Thornhill Park & Ride, and the increase of long-stay charges, in November 2013. Work on creating the 500 new spaces at Thornhill Park & Ride commenced in January and was completed in July 2013. The number of parking spaces rose from 850 to 1,356. Before work could start, grass snakes had to be relocated. The site is to the east of the existing site, not as originally stated in the Oxford Mail below. To set up a “Boris bike” cycle hire scheme at the Thornhill Park & Ride (funded by part of the remaining £1.5m, which will also be used to promote the county’s car-sharing scheme). Cycle hire will also be adopted at the city’s four other Park & Rides if it is successful. A consultation on the proposed bus lane near the Green Road Roundabout closed on 25 July 2013. 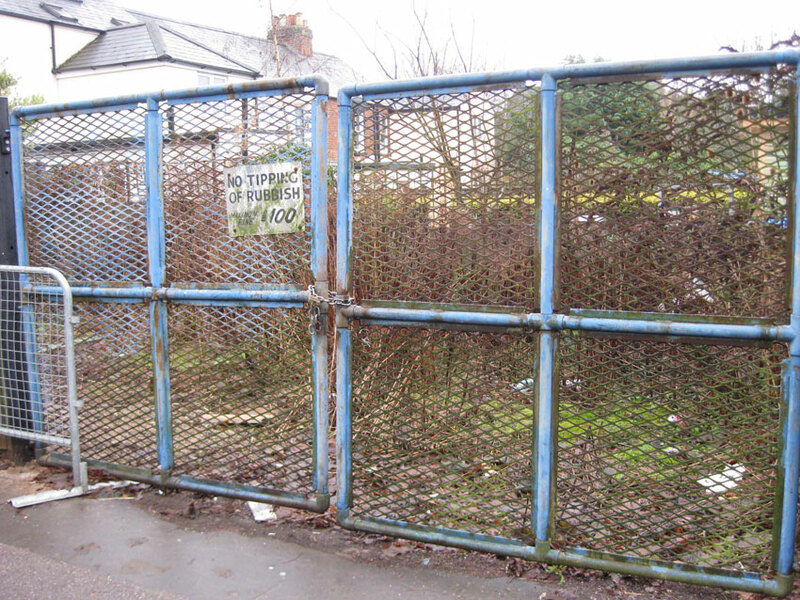 An earlier outline planning application to demolish the block of eleven garages to and erect three single-storey one-bedroomed bungalows was refused in March 2012 (11/03287/OUT) . Planners “raised no objection” to planning application 12/01542/CC3 for the demolition of the existing teaching wing, gym, kitchen and circulation to the west of the existing school hall and the construction of a new single-storey admin and kitchen extension, a new music entrance, a new two-storey KS2 infill block, a new KS1 extension, and a new foundation-stage extension. In addition there would be a new pedestrian access on Bayswater Road. Altered pedestrian and cycle entrance on Waynflete Road, a new pedestrian and cycle entrance on Waynflete Road adjacent to the vehicular entrance, a new parking area for the Schools Music Service utilising the existing vehicle entrance, and the creation of a new hard games court adjacent to the playing field. Oxford Health NHS Foundation Trust in 2013 took over the ownership of Warneford Meadow in Headington from the Department of Health, pledging to preserve it for the community. The C.S. Lewis Foundation and C.S. Lewis’s stepson Doug Gresham were shocked by a scheme to build sheltered accommodation with an access road running past The Kilns and the neighbouring nature park in Risinghurst. Ronald McDonald House Charities want to built a new £5m unit where more parents can stay when their children are patients at the Oxford Children’s Hospital.